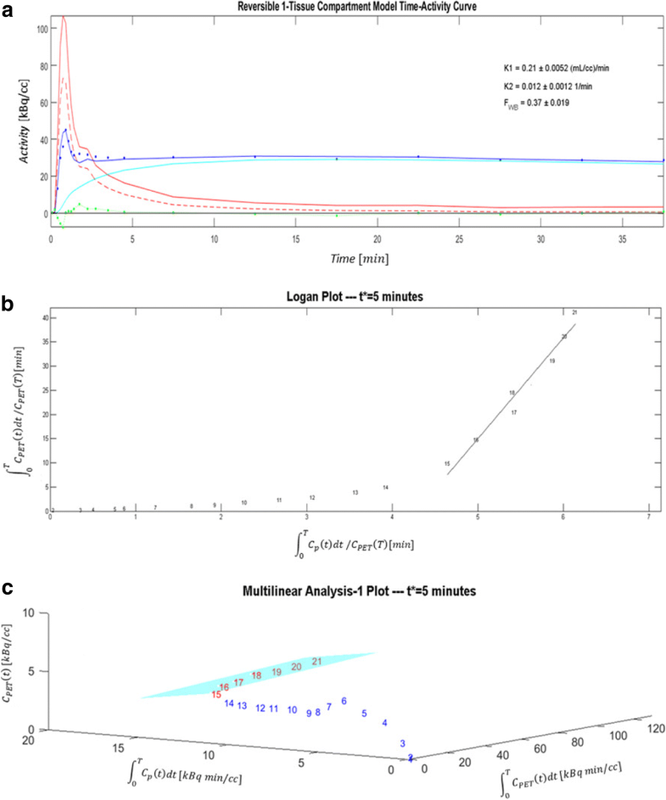 Graphical methods of radiotracer kinetic modeling in PET are ideal for parametric imaging and data quality assurance but can suffer from noise bias. This study compared the Logan and Multilinear Analysis-1 (MA1) graphical models to the standard one-tissue-compartment (1TC) model, including correction for partial-volume effects, in dynamic PET-CT studies of myocardial sympathetic innervation in the left ventricle (LV) using [11C]HED. Test and retest [11C]HED PET imaging (47 ± 22 days apart) was performed in 18 subjects with heart failure symptoms. Myocardial tissue volume of distribution (VT) was estimated using Logan and MA1 graphical methods and compared to the 1TC standard model values using intraclass correlation (ICC) and Bland-Altman analysis of the non-parametric reproducibility coefficient (NPC). A modeling start-time of t* = 5 min gave the best fit for both Logan and MA1 (R2 = 0.95) methods. Logan slightly underestimated VT relative to 1TC (p = 0.002), whereas MA1 did not (p = 0.96). Both the MA1 and Logan models exhibited good-to-excellent agreement with the 1TC (MA1-1TC ICC = 0.96; Logan-1TC ICC = 0.93) with no significant differences in NPC between the two comparisons (p = 0.92). All methods exhibited good-to-excellent test-retest repeatability with no significant differences in NPC (p = 0.57). Logan and MA1 models exhibited similar agreement and variability compared to the 1TC for modeling of [11C]HED kinetics. Using t* = 5 min and partial-volume correction produced accurate estimates of VT as an index of myocardial sympathetic innervation. Developed as a positron emission tomography (PET) imaging agent to target the cardiac sympathetic nervous system, carbon-11-labeled meta-hydroxyephedrine ([11C]HED) is a norepinephrine analog that is taken up by nerve terminal varicosities in the myocardium, and used to assess sympathetic nerve function . Since its genesis, it has been the cornerstone PET tracer for cardiac sympathetic innervation, employed in determination of neuronal-based defects leading to improved diagnosis and prognosis for pathologies such as heart failure, arrhythmia, and cardiomyopathy, in which cardiac neuronal function is often compromised, leading to decreased catecholamine sensitivity and lowered beta adrenergic receptor density . Using PET [11C]HED imaging of cardiac tissues, the volume of distribution (VT) of the injected radiotracer is an invaluable metric that quantifies the uptake and retention of tracer, providing an index of sympathetic nerve density and reuptake-1 transporter activity. For cardiac PET applications especially, VT and other kinetic modeling parameters measured in the myocardium may be used to aid in the diagnosis of various innervation and perfusion-based pathologies. In PET imaging studies, VT is defined as the equilibrium ratio of tracer concentration in tissue to that of unmetabolized parent tracer in plasma, but this direct measurement is typically not feasible due to the long time needed to reach equilibrium. Alternatively, kinetic modeling is commonly used to determine VT from a significantly shorter temporal sample following tracer injection . While the physiological kinetics of [11C]HED may be modeled using a two-tissue-compartment model, the one-tissue-compartment (1TC) model has been shown to provide a robust representation with optimal clinical reproducibility in myocardial uptake studies, without sacrificing the accuracy of VT quantification . Two graphical methods reported in the literature for kinetic modeling of reversible-binding tracers are the Logan  and Multilinear Analysis-1 (MA1) models , which are both computationally simpler than non-graphical (compartmental) methods , while being able to provide visual representations of kinetic parameters. The Logan method has been established as the standard graphical model to estimate VT in a wide range of PET applications in the brain and heart, while MA1 was proposed as an alternative numerical formulation to estimate VT with lower noise bias compared to Logan estimates . Although [11C]HED is a widely used tracer, a comprehensive evaluation of the performance of the graphical and non-graphical methods to quantify its kinetics has not been performed. Furthermore, the effects of partial-volume losses on quantification of VT have not been well defined in the context of graphical kinetic modeling in the heart, where the effects of blood-pool spillover and motion are more apparent compared to the brain. The goal of this study was to determine a method of partial-volume correction applicable to graphical kinetic modeling and to compare the Logan and MA1 models to the standard 1TC kinetic model for accurate quantification of myocardial sympathetic innervation using dynamic [11C]HED PET-CT studies. Twenty-three heart failure patients were recruited as control subjects for a previous study (PET-OSA: NCT00756366) investigating the effects of continuous positive airway pressure (CPAP) on sympathetic nerve function and cardiac energetics in heart failure patients with obstructive sleep apnea (OSA) . These control patients had the same inclusion and exclusion criteria as the PET-OSA study, except they did not have OSA. Patient demographics were collected at baseline and follow-up visits. Three of the 23 patients were missing baseline or follow-up PET scans and were excluded. Two other patients were also excluded: one with atrial fibrillation at baseline that was treated before the follow-up scan and the other with uncorrectable severe motion artifact, leaving N = 18 subjects included in the final analysis. All patients provided written informed consent, according to the research protocol approved by the Human Research Ethics Board at the University of Ottawa Heart Institute. [11C]HED was synthesized from [11C]methyl-iodide and metaraminol-free base, with the use of standard methods for high purity and specific activity . Images were obtained at baseline and follow-up (47 ± 22 days apart) on the ECAT-ART PET (Siemens/CTI, Knoxville, TN) or Discovery RX PET-VCT (GE Healthcare, Waukesha, WI) scanner, with ECG, heart rate, and blood pressure monitored at regular intervals. A transmission scan for attenuation correction was performed using Cs-137 isotope or X-ray CT , immediately after which 10–15 mCi (370–550 MBq) of [11C]HED was injected over 30 s and a dynamic PET series was acquired over a 40-min period (10 × 10 s; 1 × 60 s; 5 × 100 s; 3 × 180 s; 4 × 300 s) . Image reconstruction was performed using filtered-back-projection with a 12-mm Hann filter and all corrections enabled for quantification of radioactivity concentration . The tracer volume of distribution VT in the myocardium is defined as the ratio of the concentration of tracer in tissue divided by the concentration of tracer in arterial plasma, after the system has reached equilibrium (at t ≥ TE) . Where CT is the concentration of tracer in myocardial tissue and Cp is the concentration of tracer in plasma. 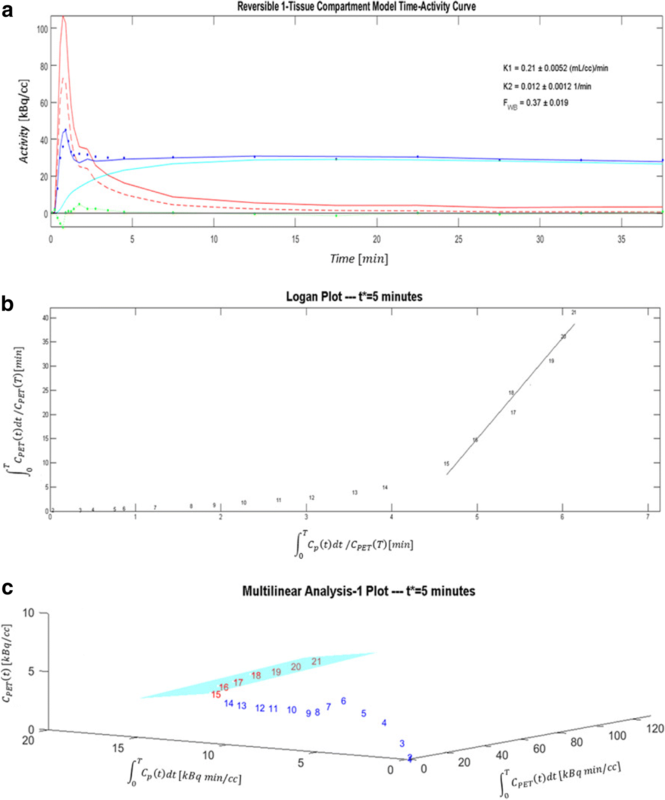 For a reversible 1TC kinetic model, the rate-of-change of tracer concentration in myocardial tissue is defined using the rate of influx from arterial plasma-to-tissue (K1) and the rate of efflux from the tissue compartment (k2) according to Eq. 3. From (11), we propose that VT may be estimated from VROI, with plasma-to-whole-blood and metabolite corrections as well as partial-volume effects considered explicitly. CROI(t) and Cp(t) time-activity curves are used as measured input data. At a certain time (t*), the intercept term (Int) will become a constant value , at which point the equation becomes a linear system where the slope represents the volume of distribution in the ROI. Since the measured tissue curve CROI(t) is subject to blood spillover and partial-volume losses, only VROI may be obtained from the graphical model directly. Previous applications of this model have estimated VROI without explicit correction factors for partial-volume effects, which is required for cardiac applications. In our proposed model, Eq. (11) may be used to determine VT from the slope determined by the Logan model. VTmay again be determined from the VROI value estimated using MA1, according to the relation defined in (11). The estimation start-time (t*) was varied systematically from 1.5 to 20 min for a subset of five [11C]HED studies to determine the optimal value to be used for the main analysis. Goodness-of-fit was evaluated on the Logan plot as the Pearson correlation (r2) of the points from t* to 40 min, indicating the subset of points best described by a line. Since the r2 is not effective to assess goodness-of-fit of the near-horizontal fitted plane on the MA1 plots, an alternative metric was computed using the relative standard error of the estimate (rSEE) as 1 − SEE/mean. The optimal t* was determined by comparing VT values from the graphical methods to the 1TC model standard. Then, all subsequent analysis was performed using the same start-time for both Logan and MA1 models. The compartmental and graphical analysis models were implemented in the FlowQuant® analysis software (University of Ottawa Heart Institute, ON). The operator reliability of this automated software has been reported previously . Briefly, the left ventricle (LV) myocardium was segmented automatically and partitioned into voxels using a 2D polar-map representation, with each voxel representing a transmural sub-region of the LV myocardial tissue. The arterial whole-blood (WB) ROI was positioned automatically at the center of the left atrioventricular valve plane. Time-activity curves were generated based on measured tracer activity in the LV cavity CWB(t) and myocardial tissue CT(t) ROIs, as input to the tracer kinetic models. In each polar-map voxel, the 1TC model rate constants K1 and k2, as well as VT and the blood spillover fraction FWB, were estimated using weighted least-squares regression, according to Eqs. (3), (4), and (5). The Logan and MA1 graphical models in Eqs. (12) and (13) were used to calculate LV polar-maps of VROI. Scan-specific spillover values were calculated as the polar-map median FWB and the corresponding partial-volume recovery coefficient RC (1 − FWB), which were then used to estimate VT from the graphical model estimates of VROI according to Eq. (11). Image and data analyses were performed using MATLAB 2013b (The Mathworks, Natick, MA). LV median VT values obtained from the 1TC, Logan, and MA1 methods were tabulated. Inter-model and test-retest mean effects were evaluated using two-way repeated measures ANOVA. Bland-Altman analyses and Intra-class correlation (ICC) were employed to evaluate the inter-model (MA1 vs 1TC, and Logan vs 1TC) and test-retest (baseline vs follow-up) reliability [19, 20]. Absolute-agreement ICC with two-way mixed effects was used for the inter-model reproducibility and test-retest repeatability . To correct for skew in the VT distributions, VT values were logarithmically transformed before the ANOVA and ICC analyses. ICC values were categorized as: ICC > 0.90 excellent, > 0.75 very good, > 0.40 good, and ≤ 0.40 poor . The limits-of-agreement of repeated measures were estimated using the following: (i) median difference ± non-parametric repeatability coefficient (NPC = 1.45 × IQR) to account for the variable effect of outliers and (ii) mean difference ± coefficient-of-repeatability (CR = 1.96 × SD). √(3/N) × SDdifference(t95%, n − 1) was used to calculate the 95% confidence intervals on the limits-of-agreement, where N is the number of pairs being analyzed . Differences in VT values were divided by the mean VT to account for the increased variability of differences associated with increased mean VT. The NPC was also reported as it is a more robust measure of repeatability . Non-parametric Levene’s test was used to assess the equality of variance between groups. Bias in the Bland-Altman plots was assessed using the one-sample Wilcoxon Signed Ranked test against zero. A 2-tailed p value < 0.05 was considered statistically significant for all tests. Statistical analyses were performed using Excel 2016 (Microsoft) and SPSS 20.0 (IBM). Baseline patient demographics are listed in Table 1. Most patients in this study were male (66.5%) with mean age of 66.5 ± 9.3 years. The majority (83.3%) were classified as having NYHA Class II heart failure and were taking one or more cardiac medications. The demographics were stable at follow-up compared those reported at baseline. Table 2 shows the goodness-of-fit metrics for the five patients randomly sampled from the entire cohort used for this study. These ranged from 0.80 to 0.99 across all scans and t* values of 1.5–20 min, as summarized in Fig. 1. Corresponding VT values ranged from 9 to 21 mL/cm3 for Logan and 10–28 mL/cm3 for MA1. The Logan VT increased systematically up to approximately 5–15 min, interpreted as the start of the steady-state (linear) phase. There was no t* value with Logan VT estimates equal to the 1TC reference value (20 mL/cm3); therefore, t* = 5 min was selected as the optimal start-time based on agreement of the MA1 VT values with the reference 1TC model. This value of t* also demonstrated the highest Logan r2 value (0.96), suggesting the best fit of a line was obtained for the points starting at 5 min. MA1 plots exhibited a steady increase in goodness-of-fit up to 5 min (0.97) with relatively little improvement at later start times. Figure 2 shows VT polar-maps from a single patient scan using all 3 models, including graphical representations of the Logan and MA1 plots as well as the 1TC modeling results in Fig. 3. VT polar-maps were found to show very similar spatial distributions for all three kinetic models, as expected. At baseline, VT values were 20 ± 8 mL/cm3 for 1TC, 17 ± 8.0 mL/cm3 for Logan, and 20 ± 16 mL/cm3 for MA1, as shown in Table 3. At follow-up, VT values were 21 ± 11 mL/cm3 for 1TC, 19 ± 12 mL/cm3 for Logan, and 23 ± 16 mL/cm3 for MA1. Intra-model comparison of the VT values at baseline vs. follow-up revealed that there was no significant difference between baseline and follow-up VT values for any of the models (p = 0.379). However, on average, VT values generated by Logan were 15% lower than those generated by MA1 (p = 0.002) and 12% lower than the 1TC values (p = 0.002). VT values generated by MA1 were not significantly different from those of 1TC (p = 0.958). To evaluate reproducibility between the three models, the 1TC model was taken as the reference standard for comparison with the Logan and MA1 models. Of the 36 scans compared in the inter-model analysis (Table 4, Fig. 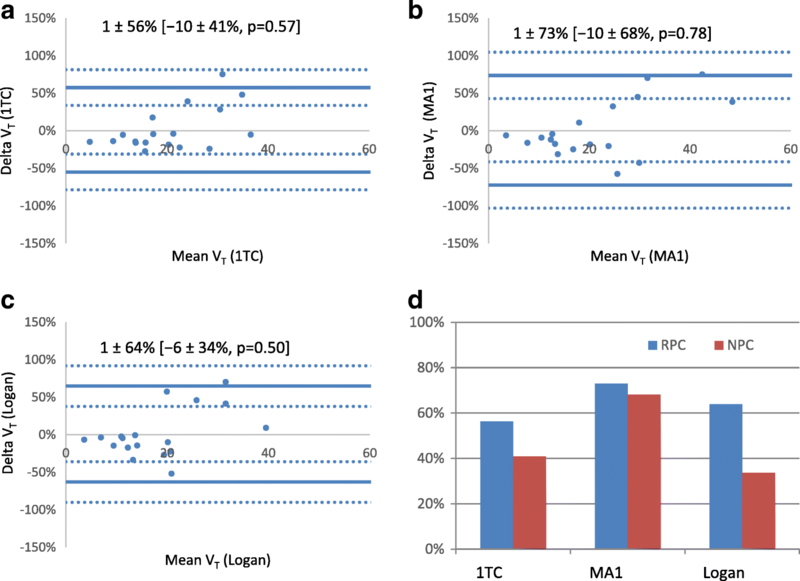 4), the Logan-vs-1TC and MA1-vs-1TC comparisons exhibited similar reproducibility with NPC ~ 26.5%. However, the VT values generated from the Logan model were systematically lower than those generated from the 1TC model (median bias = − 14.5% and mean bias = − 16.3%, p < 0.001), but there was no systematic difference in VT when comparing MA1-vs-1TC models, p = 0.2). There was excellent agreement between MA1-vs-1TC values (ICC = 0.955, 95% CI [0.915, 0.977]) and good-to-excellent agreement between Logan-vs-1TC (ICC = 0.928, 95% CI [0.432, 0.978]). There was no difference in reproducibility between the MA1-vs-1TC and Logan-vs-1TC NPC values (nonparametric Levene’s test, p = 0.915). All models demonstrated very good repeatability (Table 5) with consistent ICC values = 0.837–0.852. The mean test-retest differences were all < 2% without any systematic bias observed between baseline and follow-up (Fig. 5), but this could be the result of relatively small sample size with fewer points (N = 18) compared to the inter-method analysis (N = 36). There was no difference in the test-retest reproducibility (NPC) values between the three methods (non-parametric Levene’s test, p = 0.57). In an effort to improve and expand the use of kinetic modeling in cardiac PET studies of sympathetic innervation, we sought to evaluate multiple kinetic models for the analysis of [11C]HED studies. This was achieved by comparing the inter-method differences in VT quantified by the Logan and MA1 graphical models compared to the reference 1TC model in a sample of heart failure patients and assessing the test-retest repeatability between baseline and follow-up scans. HED PET is often used to evaluate therapy or disease progression in heart failure patients; therefore, evaluation of the test-retest repeatability is most relevant in this same population, as opposed to healthy normal subjects who generally have lower sympathetic tone. The patients’ heart failure symptoms and medications were stable over the test-retest interval; therefore, any impact on the repeatability data should be minimal. The MA1 model exhibited excellent agreement with 1TC, the Logan model exhibited good-to-excellent agreement with 1TC, and all models had good-to-excellent test-retest repeatability. 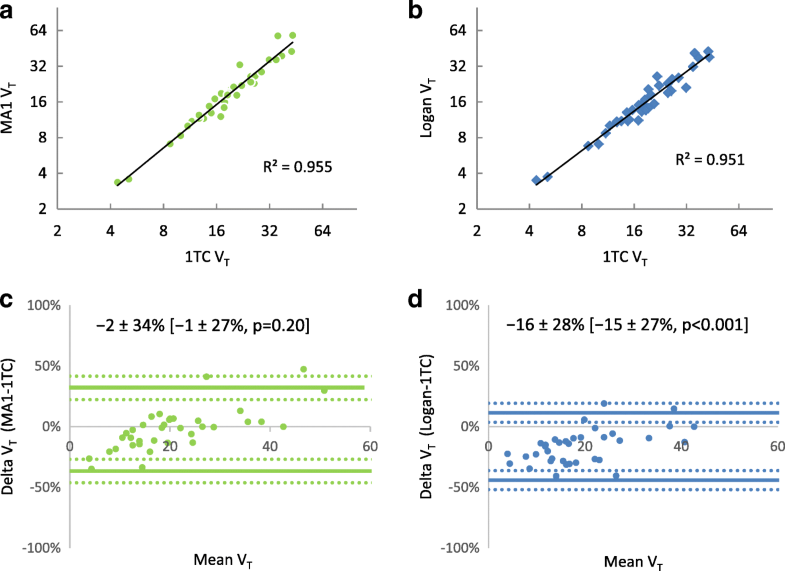 Logan VT values were significantly lower than MA1 and 1TC VT values, while MA1 VT values were not significantly different from those obtained using the 1TC model (Table 3). While 1TC is the reference standard kinetic model in this instance, graphical models such as the Logan and MA1 are computationally simpler alternatives that allow for linearized visualization and analysis of tracer kinetic data. Our findings support the reliable use of both graphical analysis methods in addition to the standard 1TC model for tracer kinetic analysis of VT. These findings agree with previous studies using other PET tracers that compared various graphical models, including the Logan method, finding the results to be in agreement with standard compartment models, but computationally simpler, and potentially more robust [24–27]. In the present cardiac PET study, partial volume and spillover corrections were critical to implement into the graphical modeling calculations to avoid misinterpretation. The commonly used Logan and MA1 methods (Eqs. 12 and 13) only estimate the volume of distribution in the PET image region (VROI) as opposed to the myocardial tissue of interest (VT). Compared to PET measurements in other organ systems such as the brain, in cardiac studies, the measured ROI region contains much more spillover of blood signal within and adjacent to the myocardial tissues. Our implementation of a partial-volume correction method based on estimated recovery coefficients and whole-blood spillover fractions allowed accurate measurement of myocardial VT values using Logan and MA1 graphical models on a scan-specific basis. In this validation study, FWB was estimated first using the 1TC with spillover model, and then used to calculate the corresponding RC values for consistent partial-volume and spillover correction of the graphical model VROI estimates. It is clear that independent estimates of RC and FWB are required to determine VT from VROI as shown in Eq. 11; therefore, any error in the estimation of these correction factors in practice will be propagated directly into the corresponding values of VT. In the present study, the average FWB value was 0.37 ± 0.07, which could be used to estimate RC and hence VT in similar patient population studies with minimal added variability. We investigated the effect of varying t* on the graphical model results (Table 2), which quantified VT using the plotted values at t ≥ t*. It has been reported that t* may be deduced directly from kinetic modeling data for some tracers , but the method we presented used a simpler and systematic approach to determine the t* which produced the same VT values on average compared to the MA1 plots. This approach is beneficial for tracers for which it is more difficult to estimate t* directly from the study data, such as those with relatively slower kinetics . It also removes the need to estimate t* for each individual scan, which may be subject to variable noise effects. We propose t* = 5 min as an effective start-time for cardiac studies employing [11C]HED as it also gave the highest quality of linear fit (r2 > 0.95) using the Logan model, in addition to MA1 estimates of VT that were equal to the 1TC reference value on average. This start time was shown with our comparison of the three models to be robust, producing results for VT with excellent goodness-of-fit to the graphical models and inter-method agreement. It is worth noting that a slightly later start time of 10–15 min may have provided Logan VT values that correspond better with 1TC and MA1 (Fig. 1), but at the cost of a lower quality fit of the linear model and wider variability due to fewer fitted points. Interestingly, the VT values determined by Logan were significantly lower than those determined by both MA1 and 1TC, while VT values determined by MA1 did not show a significant difference to those obtained from 1TC. More precisely, Logan exhibited a greater negative bias where VT was underestimated relative to 1TC, whereas a bias was not present between MA1 and 1TC (Table 4). In a similar kinetic model comparison using [18F]FCWAY and [11C]MDL neurological tracers, Ichise et al. demonstrated that the MA1 model generated higher VT estimates than Logan, and that MA1 exhibited less bias compared to Logan at multiple imaging noise levels. Our results are consistent with these findings, affirming the original report of MA1 as a method to reduce the magnitude of bias induced by noise when using the Logan model . Although Logan seemed to underestimate VT in our study population, it should be realized that the median bias of − 14.5% relative to the 1TC gold standard did not greatly affect the inter-model reproducibility of the models, which exhibited good to excellent agreement despite the bias that was present. The use of [11C]HED to examine sympathetic function in cardiac PET is becoming increasingly widespread. Recently, it has been shown to be a powerful diagnostic and prognostic tool for patients with heart failure, arrhythmias, flow-innervation mismatches, and microvascular dysfunction in both infarcted and non-infarcted tissues [1, 29–33]. This field continues to be improved and shows promise for a wider variety of applications . As cardiac innervation tracers increase in prevalence, the optimization and validation of kinetic modeling techniques becomes more important; extensions of the current study may be anticipated, such as those investigating the use of a two-tissue-compartment model to quantify cardiac NET re-uptake function more specifically. Moreover, comparisons of multiple kinetic modeling options, in particular those of a graphical nature as presented here, are possible with other cardiac innervation-based tracers such as the [18F]-labeled sympathetic innervation tracers MFBG, MHPG, LMI1195, etc., for more detailed evaluation of their kinetics [35, 36]. A few limitations were present in this study. The current study is a retrospective, single-center study that examined stable heart failure patients only from the PET-OSA trial. The results may be limited by the relatively small sample size (N = 18). Larger prospective studies would be beneficial to further validate the performance of the kinetic models as proposed. A start time of 5 min was found to provide the best fit for Logan and MA1 models. The MA1-1TC comparison demonstrated excellent agreement while Logan-1TC and test-retest comparisons demonstrated good-to-excellent agreement when quantifying VT with partial volume correction. Although Logan underestimated VT due to the recognized noise bias, Logan and MA1 both exhibited similar test-retest variability, suggesting that they may be used in addition to 1TC in the modeling of [11C]HED kinetics, with benefits of greater computational simplicity and the ability to mathematically visualize kinetic parameters for better quality assurance. Tong Wang and Kai Yi Wu contributed equally to this work. Networks of Centres of Excellence of Canada (NCE-15-P06-001), Ontario Research Foundation (ORF-RE07-021). The data will not be shared because it will be used in other upcoming studies. TW performed kinetic analysis, created figures, and wrote the manuscript. KYW performed statistical analysis, created figures and tables, and wrote the manuscript with TW. TW and RdK formulated partial volume correction. RCM processed clinical studies and assisted in creation of figures. JMR assisted in implementation of kinetic analysis tools. RSB and RdK supervised project development and analysis. All authors were involved in the editing process. All authors read and approved the final manuscript. All research subjects provided written informed consent, as approved by the Human Research Ethics Board at the University of Ottawa Heart Institute. Consent has been obtained from participants to publish this work. RSB and RdK have received unrestricted university-industry grant funding from the Ontario Research Fund and Lantheus Medical Imaging. Boutagy N, Sinusas A. Recent Advances and Clinical Applications of PET Cardiac Autonomic Nervous System ImagingNo Title. Curr Cardiol Rep. 2017;19(4):33. https://doi.org/10.1007/s11886-017-0843-0.